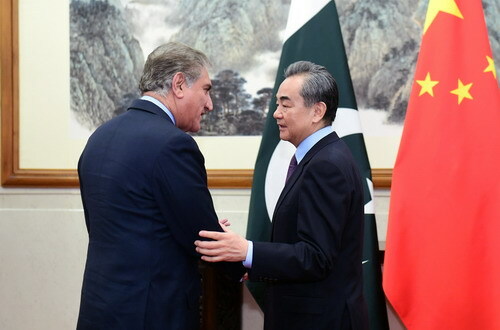 On March 19, 2019, State Councilor and Foreign Minister Wang Yi and Foreign Minister Shah Mahmood Qureshi of Pakistan held the first China-Pakistan Foreign Ministers' Strategic Dialogue and jointly met the press in Beijing. Wang Yi firstly strongly condemned the terrorist attacks in New Zealand, and extended his condolences to the unfortunate Pakistani victims in the incidents. Wang Yi expressed that the incidents showed again that terrorism is the common enemy of mankind. To fight against terrorism, we should neither apply double standards nor associate terrorism with any particular religion or country. In face of common threats, countries with different religions and cultures should join hands to combat terrorism in all forms. Wang Yi pointed out that it is an important consensus reached by leaders of the two countries during Pakistani Prime Minister's visit to China last November to establish China-Pakistan Foreign Ministers' Strategic Dialogue. It dovetails with the realistic needs of the development of China-Pakistan all-weather strategic cooperative partnership and is of great significance, and we have reached extensive consensus. We agreed that the friendship between China and Pakistan has withstood the tests of transformations of international situations, stood rock-firm and maintained vigorous vitality. 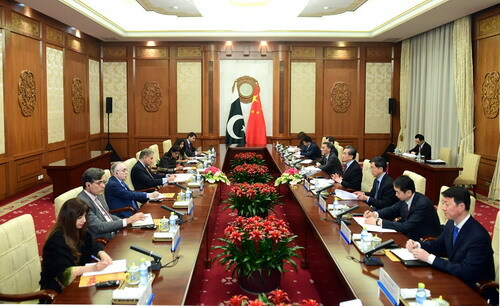 The two countries have strengthened strategic communication, deepened mutually beneficial cooperation, and forged a closer China-Pakistan community with a shared future in the new era, which not only conforms to the common interests of the two countries and the two peoples, but is also conducive to regional peace, stability and prosperity. We agreed that the two sides should continue firmly sticking to mutual support on issues concerning each other's core interests and major concerns. No matter how the international and regional situation might evolve, the Chinese side will unswervingly support the Pakistani side in safeguarding its national sovereignty and national dignity, steadfastly support the Pakistani side in independently choosing a development path that is suitable to its national conditions, firmly support the Pakistani side in achieving its national stability, development and prosperity, and sturdily support the Pakistani side in playing a more constructive role in regional and international affairs. We agreed to maintain the momentum of high-level exchanges. The Chinese side warmly welcomes Prime Minister Imran Khan to attend the second Belt and Road Forum for International Cooperation and the International Horticultural Exhibition in China. The two sides will well plan other high-level exchanges to provide sustained impetus for the development of bilateral relations. We agreed to actively advance the construction of the China-Pakistan Economic Corridor (CPEC). The two sides will jointly ensure the sustainable operation of the established projects of the CPEC to provide strong support for the economic take-off of Pakistan. Both sides will well plan and implement industrial parks and new projects in social livelihood to create a new engine for the sustainable development of Pakistan. The two sides will take forceful measures to well safeguard the safe environment for the construction of the CPEC. We agreed to enhance counter-terrorism and security cooperation. The Chinese side appreciates the strong counter-terrorism measures Pakistan has recently taken within the country, and fully supports the Pakistani side in following through on its commitment to counter-terrorism actions. The international community should treat Pakistan's long-term commitment to and effort in combating terrorism in an impartial manner. We agreed that a peaceful and stable South Asia conforms to the common interests of all regional countries, and is also the common expectation of the international community. The Chinese side appreciates the constructive efforts made by the Pakistani side to ease the situation, and calls upon Pakistan and India to exercise restraint and resolve differences through dialogue and peaceful means. The Charter of the United Nations and the norms of international law should be earnestly observed. We agreed to support the inclusive reconciliation process of "Afghan-owned and Afghan-led", and encourage the Afghan Taliban to join Afghanistan's peace and reconciliation negotiation at an early date. The Chinese side appreciates the important role played by the Pakistani side in this regard. The Chinese side and the Pakistani side will strengthen the China-Afghanistan-Pakistan Foreign Ministers' Dialogue mechanism, further give play to the potential of this mechanism, and carry out more communication and cooperation with the Afghan side. 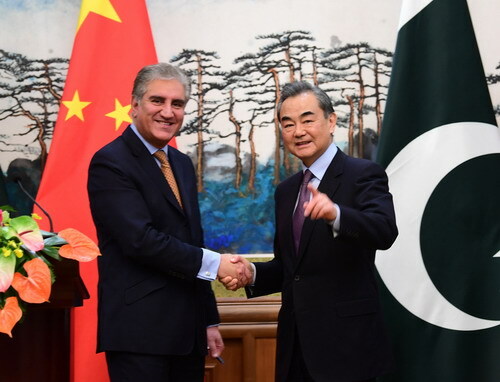 Shah Mahmood Qureshi totally agreed with Wang Yi, and congratulated on the 70th anniversary of the founding of the People's Republic of China. He believed that China will make greater development achievements in the future. Shah Mahmood Qureshi expressed that Pakistan and China are all-weather strategic cooperative partners. All Pakistani people are committed to promoting the construction of the CPEC, and expanding bilateral cooperation in various fields. Prime Minister Imran Khan looks forward to attending the second Belt and Road Forum for International Cooperation in China to push Pakistan-China relations for more positive outcomes.